The Kappa Cassiopeiae bow shock shows up as a vividly red color. 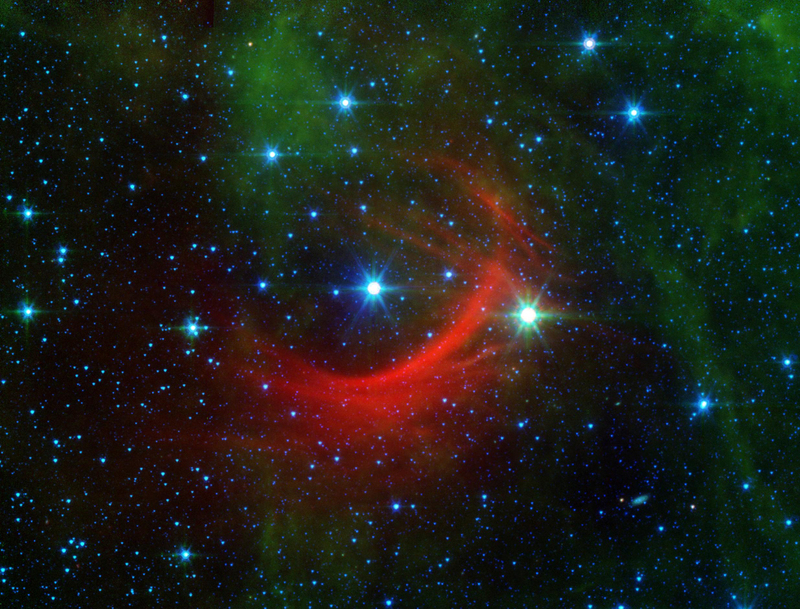 The faint green features in this image result from carbon molecules, called polycyclic aromatic hydrocarbons, in dust clouds along the line of sight that are illuminated by starlight. Delicate red filaments run through this infrared nebula, crossing the bow shock. Some astronomers have suggested these filaments may be tracing out features of the magnetic field that runs throughout our galaxy. Since magnetic fields are completely invisible themselves, we rely on chance encounters like this to reveal a little of their structure as they interact with the surrounding dust and gas.